Daniel Jacobs silenced “The Latin Snake” with a definitive, punishing victory in a re-run of their 2015 contest. 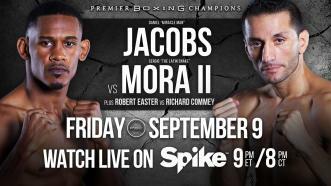 World champion Daniel Jacobs puts his 160-pound title on the line in a rematch against former 154-pound champion Sergio Mora. Welcome to our debut episode of PBC Jabs hosted by Jordan Hardy featuring the latest news and updates from Premier Boxing Champions. In this episode we break down David Peralta's stunning upset over Robert Guerrero on August 27th, Sergio Mora calls in for a round of Rapid Fire and we preview 1 of our top 5 Greatest Hits from August 2016 featuring an exciting knockout! Tell us what you thought of this episode by tweeting us at @premierboxing and @PBCJordanHardy using #PBCJabs! NBC's pick for Round of the Year goes to round 1 of Jacobs vs Mora. 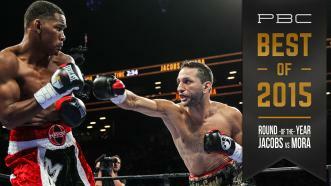 First Jacobs landed a hard right that dropped Mora. 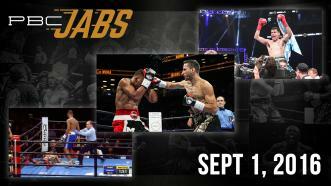 He got back to his feet and landed a clean left hook which dropped Jacobs. For the remainder of the round the fighters battled for supremacy. 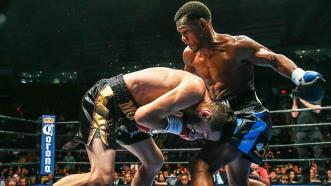 Jacobs won by second-round TKO when Mora injured his right ankle on a knockdown and could not continue.